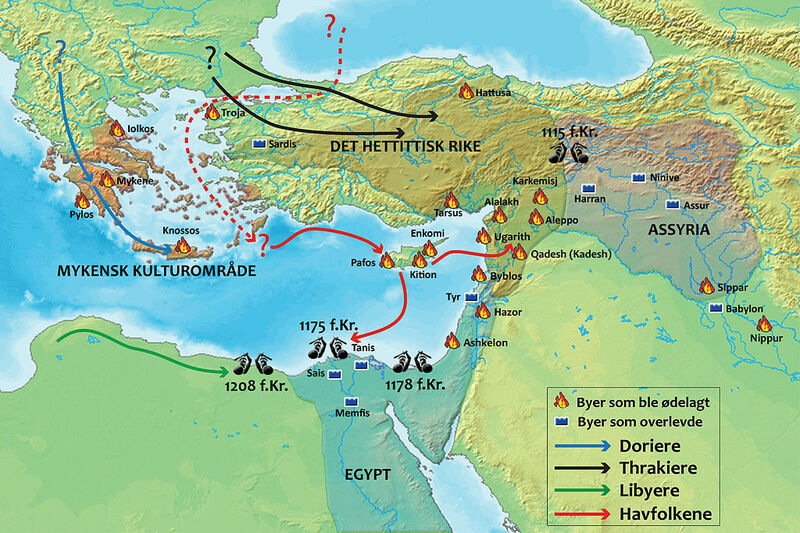 Yesterday we were discussing Bronze Age European/Mediterranean trade networks and civilizations. My suspicion is that these societies were more advanced and complex than we generally give them credit for, (especially the northern European ones) simply because we don’t have any written records from them and the archaeological trail is scanty. 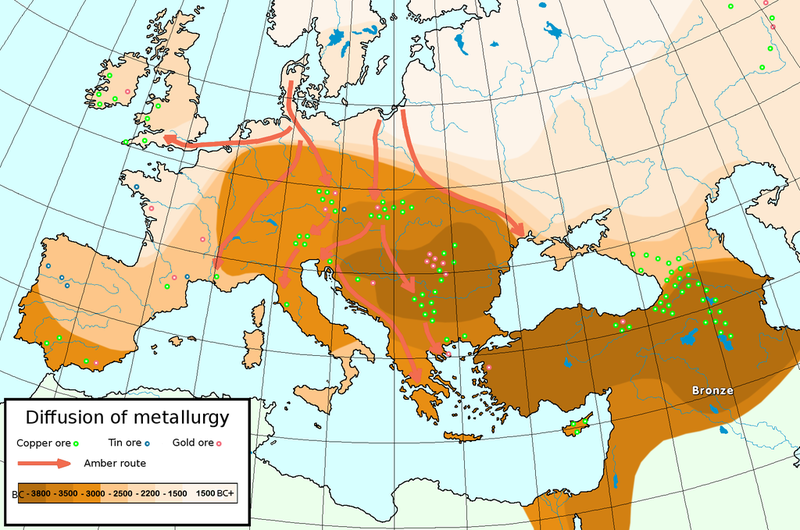 We have amber, traded from the Baltic Sea down to Italy, north Africa, the Levant, and beyond; tin, mined in Cornwall, Spain, Brittany, and southern Germany, then traded all across Europe, north Africa, and the Middle East; and of course copper, which was mined all over. And then, around 1200 BC, it all collapsed. Within 50 years, almost every major city in the eastern Mediterranean was sacked, destroyed, conquered, or abandoned. 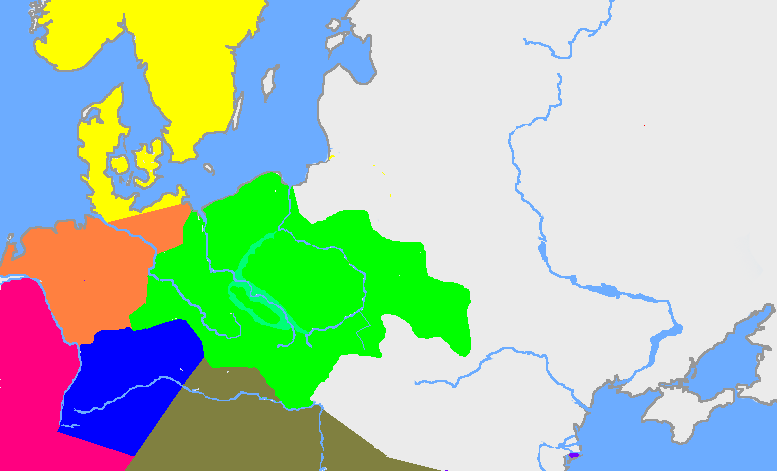 The kingdoms of Mycenaen Greece, the Hittites of Syria and Anatolia, and the New Kingdom of Egypt (and Canaan) all collapsed. The written language of Greece (“Linear B”) was completely forgotten and disappeared. The Hittite capital was burned, abandoned, and never rebuilt; Anatolia didn’t return to its former level of complexity for a thousand years. Babylon and Troy were sacked; Egypt was invaded by the Libyans. the Weshesh, who have not been strongly linked to a people documented in other sources. The most famous Sea People were the Philistines, who appear to have hailed originally from the Aegean before being defeated by the Egyptians and settled in the southern Levant, where they came into conflict with the Israelites. 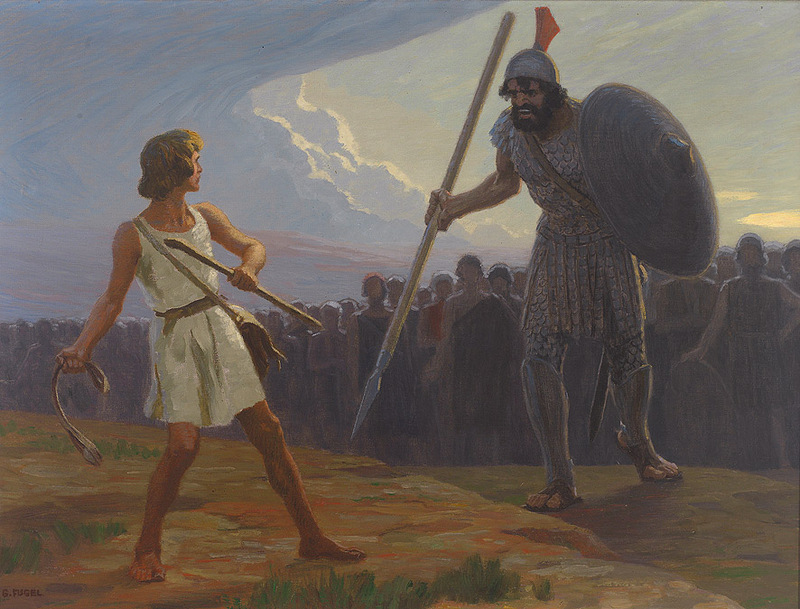 There’s fairly decent evidence for the Philistine connection, because we have written accounts about them from the Egyptians and the Hebrews, plus the archaeological remains of their cities, which are full of Greek pottery. Most of the other potential identifications are based on little more than linguistic similarity–in other words, we don’t really have any idea where a lot of them came from. 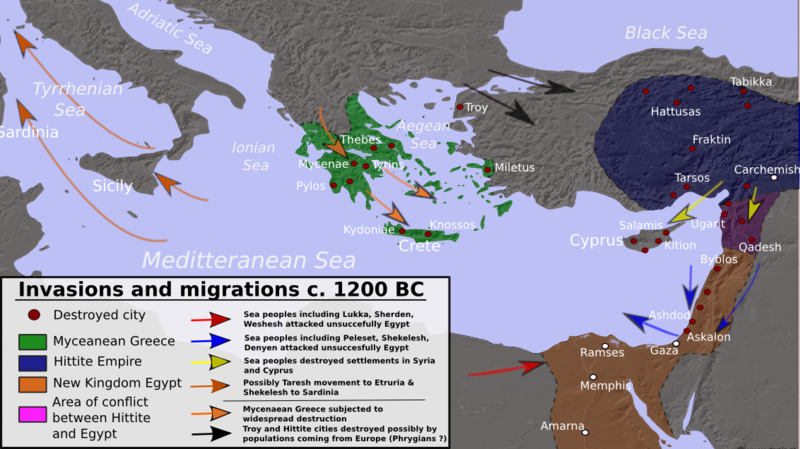 In Greece, the invaders appear to have come by land, migrating from the north, not the sea. One of the things I’ve noticed about migrations is that once they start, (for whatever reason,) they keep going. Suppose a famine hits Group A, so they flee the area and displace Group B. Group B pushes out Group C, who take to the seas and end up destroying towns hundreds or thousands of miles away. Events in Mongolia can reverberate into Poland; a sudden abundance of food and medical care in Africa ends with migrants in Sweden. 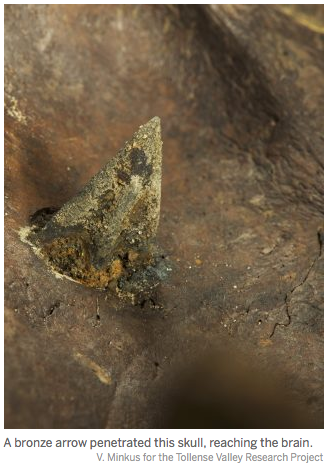 Along a 3-kilometer stretch of the Tollense River, archaeologists … have unearthed wooden clubs, bronze spearheads, and flint and bronze arrowheads. They have also found bones in extraordinary numbers: the remains of at least five horses and more than 100 men. Bones from hundreds more may remain unexcavated, and thousands of others may have fought but survived. 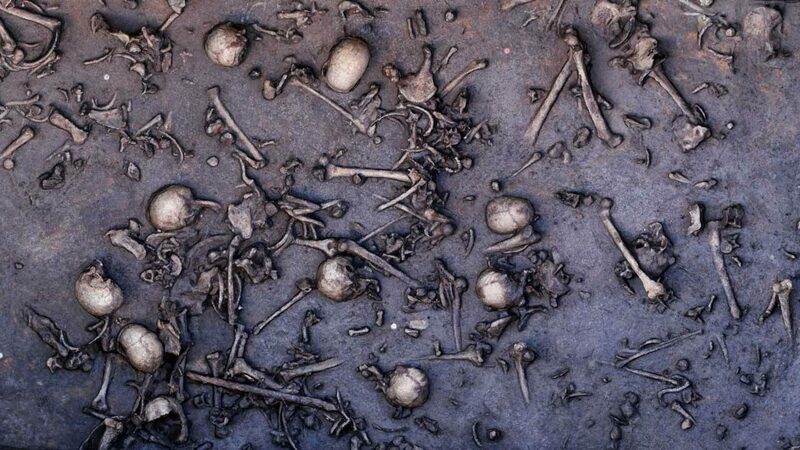 In one spot, 1478 bones, among them 20 skulls, were packed into an area of just 12 square meters. Archaeologists think the bodies landed or were dumped in shallow ponds, where the motion of the water mixed up bones from different individuals. 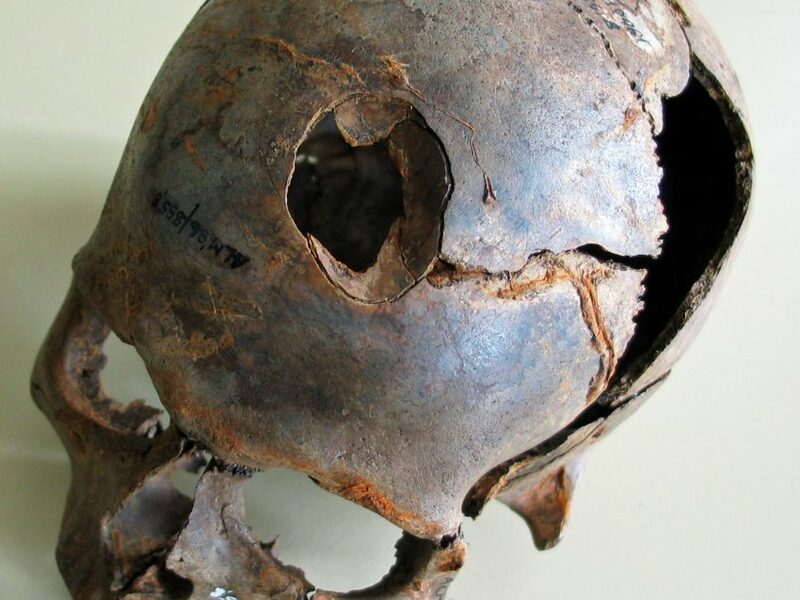 By counting specific, singular bones—skulls and femurs, for example—UG forensic anthropologists Ute Brinker and Annemarie Schramm identified a minimum of 130 individuals, almost all of them men, most between the ages of 20 and 30. The article has some entertaining illustrations, so I urge you to take a look. The Tollense is a small river in north east Germany, near the Baltic Sea and fairly close to Poland. We have yet to find the remains of any bronze age cities, towns, or fortresses nearby, (the closest known settlement was 350 km away,) but somebody built a 120 meter wooden causeway across the valley. You know, those Bronze Age chieftains just collected swords for show, kind of like people who watch too much anime. And yet chemical tracers in the remains suggest that most of the Tollense warriors came from hundreds of kilometers away. … archaeologist Doug Price analyzed strontium, oxygen, and carbon isotopes in 20 teeth from Tollense. Just a few showed values typical of the northern European plain, which sprawls from Holland to Poland. The other teeth came from farther afield, although Price can’t yet pin down exactly where. And not long after Tollense, the scattered farmsteads of northern Europe gave way to concentrated, heavily fortified settlements, once seen only to the south. This is basically a complete revolution in our understanding of the Bronze Age in northern Europe. Tollense is located near the apex of three different cultures: the Lusatian (centered mainly on modern Poland;) the Urnfield Cultures throughout most of Germany, (these two were related, but Wikipedia says, “The central European Lusatian culture forms part of the Urnfield tradition, but continues into the Iron Age without a notable break;”) and the Nordic cultures of the northern coast. Metal grave gifts are sparse, but there are numerous hoards (e.g., Kopaniewo, Pomerania) that contain rich metalwork, both bronze and gold (hoard of Eberswalde, Brandenburg). Graves containing moulds, like at Bataune, Saxony or tuyeres attest to the production of bronze tools and weapons at the village level. The ‘royal’ tomb of Seddin, Brandenburg, Germany, covered by a large earthen barrow, contained Mediterranean imports like bronze-vessels and glass beads. Cemeteries can be quite large and contain thousands of graves. 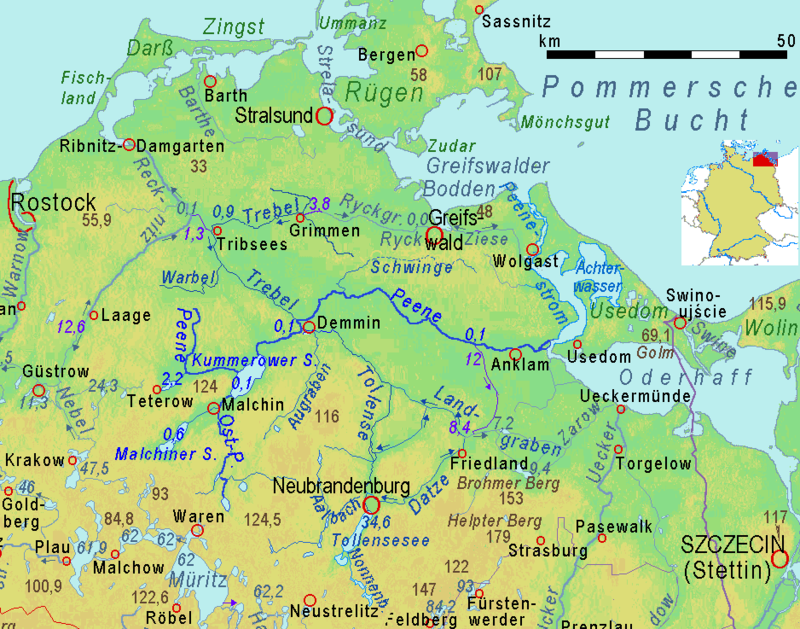 Well known settlements include Biskupin in Poland, and Buch near Berlin. There are both open villages and fortified settlements (burgwall or grod) on hilltops or in swampy areas. The ramparts were constructed of wooden boxes filled with soil or stones. Fortified hilltop settlements become common in the Urnfield period. Often a steep spur was used, where only part of the circumference had to be fortified. 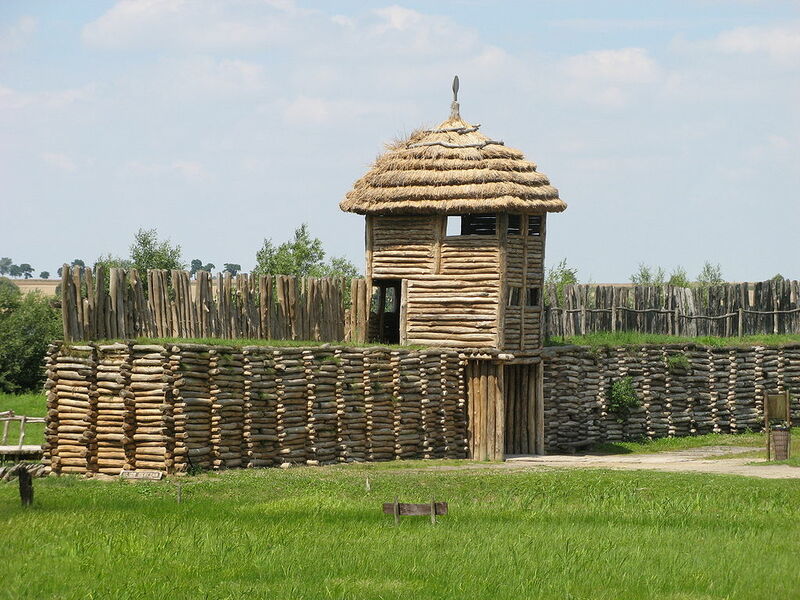 Depending on the locally available materials, dry-stone walls, gridded timbers filled with stones or soil or plank and palisade type pfostenschlitzmauer fortifications were used. Other fortified settlements used rivers-bends and swampy areas. At the hill fort of Hořovice near Beroun (CR), 50 ha were surrounded by a stone wall. Most settlements are much smaller. Metal working is concentrated in the fortified settlements. On the Runder Berg near Urach, Germany, 25 stone moulds have been found. Even though Scandinavians joined the European Bronze Age cultures fairly late through trade, Scandinavian sites presents a rich and well-preserved legacy of bronze and gold objects. These valuable metals were all imported, primarily from Central Europe, but they were often crafted locally and the craftsmanship and metallurgy of the Nordic Bronze Age was of a high standard. The archaeological legacy also comprise locally crafted wool and wooden objects and there are many tumuli and rock carving sites from this period, but no written language existed in the Nordic countries during the Bronze Age. The rock carvings have been dated through comparison with depicted artifacts, for example bronze axes and swords. There are also numerous Nordic Stone Age rock carvings, those of northern Scandinavia mostly portray elk. Of course, it is quite likely that the tumulus-urnfield transition had nothing to do with the Libyans invading Egypt and the fall of Troy. But the evidence so far points to the possibility of a much wider, more generalized catastrophe, that either began in one area and then prompted a cascade of peoples to invade and conquer their neighbors in multiple directions, or that affected several areas all at once. WWII? Marxist anthropology was describing the hunter-gatherer lifestyle as utopian as early as Engels’ “Origin of the Family, Private Property and the State”, published in 1884. For doctrinaire Marxists, the birth of civilisation, marked by the arrival of monogamous marriage and private ownership of land for farming, was when everything went wrong. It’s their equivalent of the Fall. Good point–they only became dominant in the field after WWII. Makes me think that perhaps any idea, no matter how crazy and wrong, can achieve wide acceptance if you plug it for long enough. You’re probably right. I only want to say that the idea itself was a modern version of the Arcadia, mentioned in the Renaissance, whose inhabitants were idealized peasnts and farmers. Also, the Arcadia was based on the Golden Age myth, which is the Greek counterpart of the Fall. And also, likely, a memory of Greek civilization before the bronze age collapse.